Coliseum in Manila on 25th January 1998. University of Manila (UM) won the inaugural championship held in the Philippines under the guidance of Asian University Sports Federation (AUSF) initiated by its President and Secretary General. St. Francis of Assisi College won the 2nd Asian University Basketball Championship held in the City of Manila. St. Francis of Assisi College back to back champion held at Rizal Memorial Coliseum, Manila in 2002. This Championship was televised by IBC-13 Television Network with corporate support partners - Century Park Hotel, PAGCOR, PCSO and Philippine Sports Commission. Negros Oriental province Governor George Arnaiz (3rd from left) supported the 4th AUBC held in Dumaguete City. Muong Ji University won the title of the 4th AUBC in Dumaguete City, Negros Oriental Province in the Philippines. Despite all the stones hurled at him, Graham Lim still refused to fight back. He decided to move on. Well if Philippine basketball refuses to appreciate all he had done, he’ll just continue doing it for his own agenda – to pursue his dreams for Philippine basketball and his vision for Asian dominance. Championship recently in Daet, Camarines Norte through the valuable help of government officials and private entities who still believed in him. If the success of the AUBF were to be a gauge, Lim could be a big loss for the Philippines and a huge gain for Asian basketball. Lim was very thankful to the big support of Camarines Norte Governor Jesus “Atoy” Typoco and his constituents as host of the prestigious event as well as the major corporate support of Burlington as the official sock, VEGA as the official ball, the executive outfitters from Grand Sports of Thailand who provided referee and table officials’ new uniform image to make it colorful, a corporate like “Healthy Options” provide food supplement, Tanduay, Air-21 Express, Summit Mineral Water, Baker’s Fair, Fronte Motor and the official film - Fuji Film and YKL Color. The Federation of School Sport Associations of the Philippines (FESSAP) through its president Tisha Abundo and Secretary General Prof. Robert Milton Calo was also a big factor in its huge success together with BAP President Go Teng Kok provided moral and logistic support, BAP Regional Director for Region 5 Dr. Abundio Palencia provided the manpower and the cooperation of the whole BAP-Bicol Chapter. final report and even had to join Villafuerte’s hectic motorcade schedule during the campaign period to relay the wonderful outcome of the said staging. The secret behind the success of the event was Lim’s hardwork and dedication going around the Bicol region to campaign for support and encouraging the other nearby provinces and municipalities all the way to Masbate to watch the 5th Asian University Basketball Championship in Daet. Lim also expressed his gratitude for the trust and confidence of China, Korea and Indonesia in this endeavor led by basketball great Mr. Shin Dong Pa of Korea who is the President of Asian University Basketball Federation (AUBF) and Korean-Filipino cultural director Park Hyun Mo, Madam Liu of China, Indonesian Ministry of Education thru Director Dr. Ekodjatmiko Sukarso and former FIBA President Dr. Carl Menky Ching known as the “Asia Basketball Man of the Century”, who is the honorary chairman of Asian University Basketball Federation. Sangmu of Korea emerged as champion after beating runner-up Rizal Technological University (RTU), 106-85, in the finals held at the Agro Sports Center . Huaquiao University of China ended the 2nd Runner-up while Bicol’s Best and University of Perpetual Help-Rizal (UPHR) wound up fourth and fifth. Emilio Aguinaldo College was sixth. Putra Riau of Indonesia was seventh, University of Baguio was eighth while Jimei University of China ended ninth. Lee Song Jun was voted Most Valuable Player of the week-long tournament and was joined by Ryan Regalado of RTU, Kim Sung Han and Le Song Jun of Korea, Joemar Punzalan of Bicol’s Best and Chee Li Wei of Huang Qiao in the Mythical Five. Kim Sung Han, also emerged the Finals Most Valuable Player. The Sportsmanship Award went to Jimei University of China , while Lee Hun Jae of Sangmu of Korea was named as the Best Coach. “I’m very happy over the success of the 5th AUBF Championship in Daet, Camarines Norte which also opened big doors to municipalities far away from Manila as equally successful hosts of such prestigious events,” said Lim. contribution to the community to make our provincial brothers happy. Thought it may be hard, but what really matters to us is giving them the chance to turn a once-in-a-lifetime opportunity to witness an international event a reality,” he added. 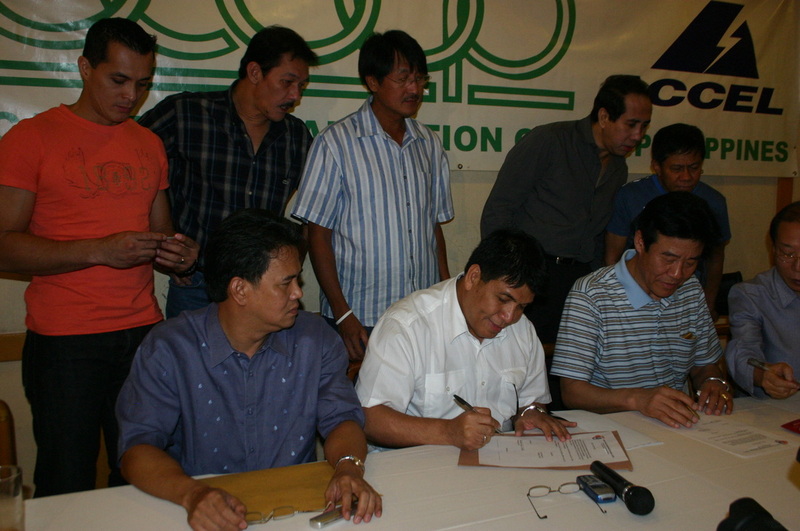 MOA signing between Basketball Association of the Philippines (BAP) and Asian University Basketball Federation (AUBF) early this year held at SCOOP Forum & witnessed by former professional great players (left to right standing) Paul Alvarez, Philip Cezar, Atoy Co, Bogs Adornador, & SCOOP President Eddie Alinea, to host the 6th Asian University Basketball Championship from July 5 to 12 in Cebu City & supported by Burlington Socks, Wilson as the official ball, Everlast Sports, Philippine Star & Summit Mineral Water. with seated from left are Atty. Romeo Magtanong BAP External Lawyer; Prospero Pichay, BAP President; Shin Dong Pa, AUBF President; and Park Hyun Mo, AUBF Director. Felix "Boy" Tiukinhoy of CESAFI; Joey Esteban of Wilson Sports; and Graham Lim, Secretary General of the Basketball Association of the Philippines (BAP). CEBU CITY - Huaqiao University of China exacted revenge against its elimination-round tormentor, the University of the Visayas, Saturday night with an 82-76 victory over the Green Lancers in the finals of the Asian University Basketball Championship at the Cebu Coliseum. Huaqiao, which earlier dropped a 67-63 decision to UV, got off to a slow start, surrendering the game's first five points and trailing by four, 11-7, in the early goings. However, the Fujian-based international school scored 14 consecutive points bridging the first and second quarters to take a 10-point lead, 21-11, on Malaysian student-playmaker Guganeswaran Batumalai's inside snipings. UV came roaring back to deadlock the score at 23-all but Zhang Jiabin connected on a three-pointer as the Chinese regained the lead, 26-23, and ignited another 8-0 run to move ahead, 31-23. Halftime score was 37-32 in favor of Huaqiao. The Chinese enjoyed their biggest lead, 68-55, midway through the fourth period. The Lancers trimmed the deficit to 74-71, on Cincoflores' three-point play at the 2:35 mark. Successive baskets by Yu Xiang and Batumalai, gave Huaqiao a seven-point cushion, 78-71, and eventually sealed the outcome. Huaqiao, which placed third in last year's AUBC competitions in Daet, Camarines Norte, had four players in double figures. Yu Xiang totaled 19 points. Batumalai, voted the tournament's MVP, collected 17, followed by Zhang's 14 (including a dozen from the three-point area) and Jiang Xinxin's 12. Chee Li Wei, a 6-7 Malaysian whose family moved to Fujian seven years ago, had four points, five rebounds and five blocks. Cincoflores and 6-11 Fil-Am Gregory Slaughter each had 15 points for the Green Lancers, who are the reigning seven-time champions in the local CESAFI league. In the battle for third place, Southwestern University waltzed to a 105-93 win over South Korea's Hanyang University. Spring Natural Water, Hotel Fortuna, Casino Alcohol, Omega Pain Reliever, Everlast, McDavid Sports. 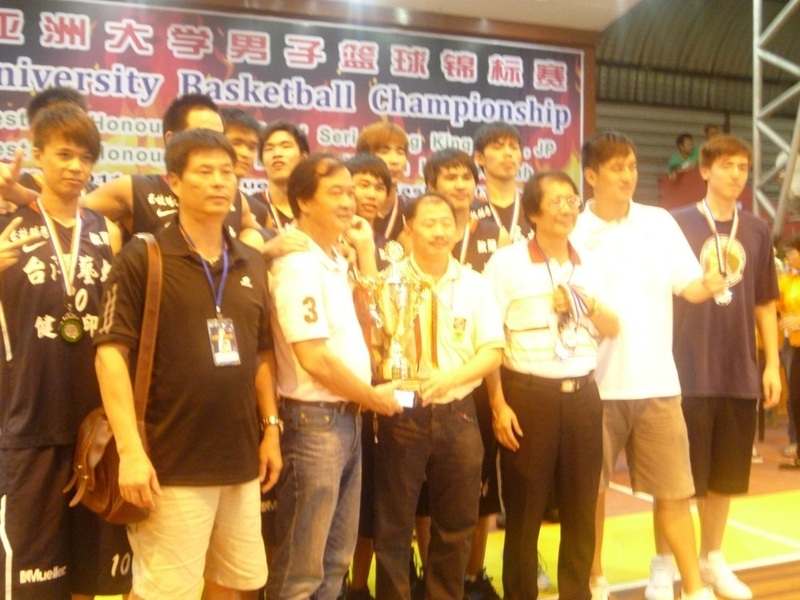 The Championship trophy to Huaqiao University was awarded by Asian University Basketball Federation (AUBF) Vice President and former Asian University Sports Federation (AUSF) Secretary General Dr. Ekodjatmiko Sukarso and BAP President Prospero “Butch” Pichay, together with China Consul General He Shi Jing, Federation of School Sports Association of the Philippines (FESSAP) Vice Chairman David Ong, Mayor Celestino Martinez, BAP Regional Director Lorenzo Sy, Commissioner Felix “Boy” Tiukinhoy of Cebu Schools Athletic Foundation Inc. (CESAFI), Burlington Representative Tony Fabico, Joey Esteban of Wilson Sports, and Basketball Association of the Philippines (BAP) and AUBF Secretary General Graham C. Lim. "Huaqiao University as one of the top contender of the 6th Asian University Basketball Championship." Huaqiao University, one of the leading men's teams in the China University Basketball Association (CUBA) in the last four seasons, will compete in the 6th Asian University Basketball Championship to be held in Cebu City from July 5-12. Based in the province of Fujian, Huaqiao is among the best international universities in the People's Republic of China with more than 30,000 students. 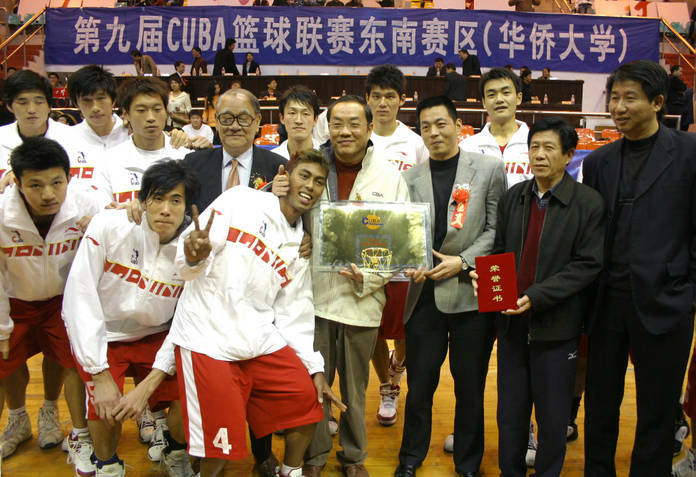 The school captured the China University Basketball Association (CUBA) title in 2003. It will be Huaqiao University's second straight appearance in the AUBC, which was established in 1998. A year ago, in Daet, Camarines Norte, the Chinese team placed third behind South Korea's Sangmu University and local bet Rizal Technological University. Among the top dignitaries to grace the eight-day AUBC competitions is Dr. Carl Menky Ching. Considered the "Father of Asian basketball," Ching, a former FIBA president who is now the FIBA's honorary life president, will be the special guest of honor and speaker during the opening ceremonies on July 5. Honorable Prospero "Butch" Pichay, the BAP and BAP-SBP president, and Congressman Luis Villafuerte, the chair of the BAP and BAP-SBP, and BAP-SBP Vice Chairman Wilson Young and BAP SBP Executive Director Christian Tan, will personally welcome Ching. All-time South Korean great Shin Dong Pa, the president of Asian University Basketball Federation (AUBF) that has a membership of more than 30 countries, will formally open the games following an inspiration talk to the participating teams. Shin, a deadly shooting forward during his heyday with the South Korean national team during the 1960s and early 1970s, is currently the vice president of the Korea Basketball Association (KBA), which sent Hanyang University to the Philippines for its first AUBC appearance here. 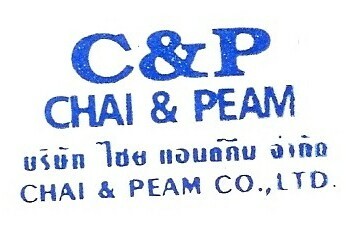 "We will show our brand of hospitality to the students from powerhouse China and South Korea and our cultural exchange program and friendship among our university students," said Pichay, who is the prime mover of this prestigious event in cooperation with BAP-SBP regional director Lorenzo Sy and with support from affiliate member Federation of School Sports Association of the Philippines (FESSAP) President Tisha Abundo and the Cebu based league - Cebu School Athletic Foundation Inc (CESAFI) under its Commissioner Felix Tiukinhoy. AUBF has been recognized by the Asian University Sports Federation since 1998. The inaugural tournament was held in the Philippines during the time of Philippine Sports Commission (PSC) chair Philip Ella Juico and among in attendance was AUSF Secretary General Dr. Ekodjatmiko Sukarso of Indonesia. 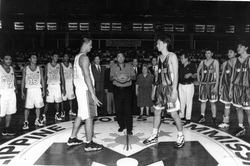 The winner of the 1st AUBC tournament in 1998 was the University of Manila (UM) under veteran coach Ato Tolentino. The Hawks beat Chinese-Taipei in the finals that year. The 6th AUBC Championship unwraps on July 5 with a 5:00 p.m. game at the Cebu Coliseum. There wil be out-of-town games in nearby Cebu cities like Bogo and Lapu-Lapu cities. Bogo City mayor Celestino Martinez, a member of the BAP-SBP Board of Trustees and chair of the Cebu Basketball League (CBL), will play host to one game date. Universal College (UC) of Parañaque pulled off a pulsating 75-73 victory over San Sebastian College-Cavite to capture the championship in the 7th Asian University Basketball Championship (AUBC)-Prospero Pichay Cup at the San Andres Sports Complex in Manila. Universal College got off to a 14-0 start and enjoyed a 43-30 lead at halftime before SSC-Cavite stormed back to trail by just two points, 56-54, entering the fourth quarter. There were four deadlocks in the final 2.5 minutes – 66-all, 69-all, 71-all and 73-all – as UC’s Mac Montilla and San Sebastian’s Chris Lucernes exchanged three-point shots. 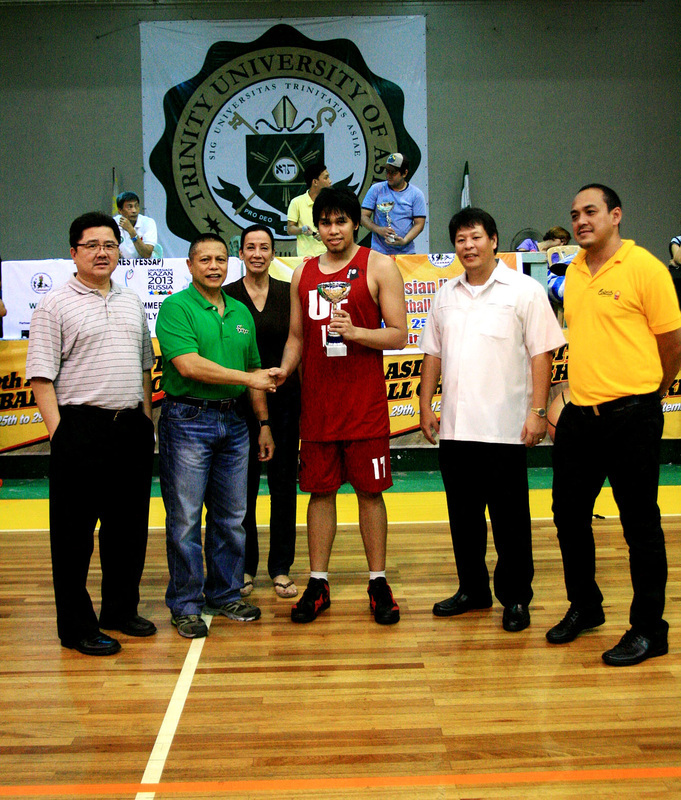 Jy Ferreria played the hero’s role for UC with a pair of game-winning free throws with 3.9 seconds left. UC, which upset Korea’s Dankook University, 76-68, in the semifinals, was led by Lester Reyes with 17 points. Joseph Daniel, Ferreria and Montilla, the tournament’s Most Valuable Player, each contributed 12 in this championship sanctioned by the Asian University Basketball Federation (AUBF) in cooperation with the Basketball Association of the Philippines (BAP) and Federation of School Sports Association of the Philippines (FESSAP). The official ball is Wilson basketball. BAP president Prospero Pichay assisted by BAP Vice Chairperson Tisha Abundo awarded the Championship trophy to Universal College led by team owner Domingo Tay and head coach Yong Garcia. Junem Gracilla knocked in 27 points for the Baycats, who suffered their first loss in five games. Tom Basa tallied 12 and Joseph Pasagui and Lucernes, a PBL veteran, had 11 apiece. 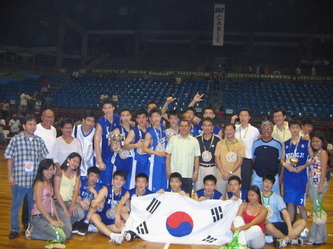 Korean team from Dankook University won the 3rd placed honor of the 7th Asian University Basketball Championship held in Manila last June 2009. Pichay and the Federation of School Sports Association of the Philippines (FESSAP) President-Dr. Godofredo Gallega and its executive vice president professor Robert Milton A. Calo. AUBF is affiliated with the Asian University Sports Federation since 1998. Universal College player's Mac Montilla receives the Most Valuable Player ward from Basketball Association of the Philippines (BAP) president Prospero Pichay and assisted by FESSAP Vice president Tisha Abundo during the closing of the 7th Asian University Basketball Championship held at San Andres Sports Complex recently with Universal College won the title over San Sebastian College. 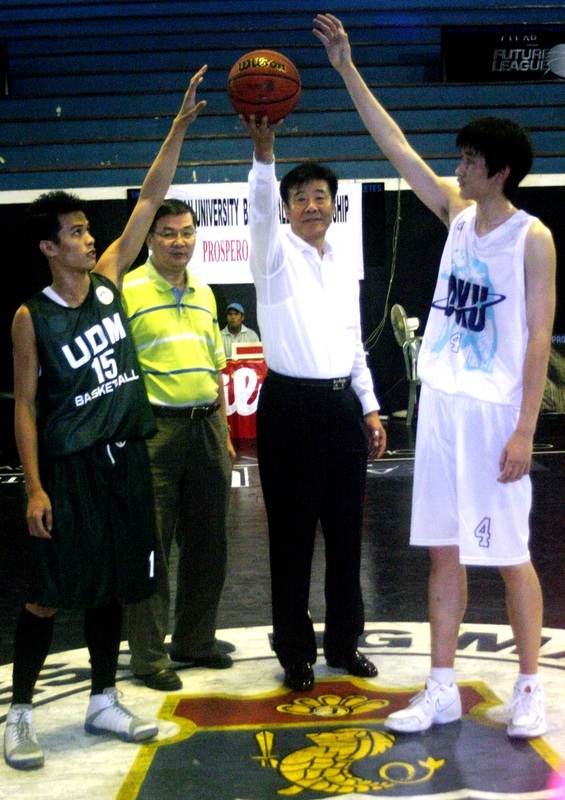 Korean basketball legend and Asian University Basketball Federation president Shin Dong Pa lead hte ceremonial toss between host school City College of Manila and Korea's Dankook University held at San Andres Sports Complex in Manila. Also in photo is BAP treasurer Tony Fabico. The 7th Asian University Basketball Championship will be held from June 5-9 at the San Andres Sports Complex in Manila. At stake in the prestigious AUBC tournament is the Prospero Pichay Cup, which is named in honor of the president of the Basketball Association of the Philippines (BAP). Korea’s Dankook University, the only foreign entry in the seven-team cast, will be arriving on June 4 in time for the start of the five-day competitions in cooperation with the City Government of Manila under Mayor Alfredo S. Lim and hosted by Manila Sports Council (MASCO)Chairman Niňo Dela Cruz. The Koreans will be welcomed by Pichay and legendary Korean basketball star Shin Dong Pa, who is the president of the Asian University Basketball Federation (AUBF) that has been recognized by the Asian University Sports Federation (AUSF) since 1998. Other prominent officials invited to the Manila meet are AUBF Honorary Chairman Dr. Carl Menky Ching, who is the FIBA Honorary Life President; Indonesia’s Dr. Ekodjatmiko Sukarso, the former AUSF Secretary general and of Indonesia and the current AUBF Vice President; Tisha Abundo, President of the National Capital Region Athletic Association (NCRAA); Prof. Robert Milton Calo, President of the Philippine Inter-School Colleges University Athletic Association (PISCUAA); and Dr. Godefredo Gallega, President of the Federation of School Sports Association of the Philippines (FESSAP). (UCAAP) titlist, will clash with Universal College (UC), the NCRAA and PISCUAA champion, in the main dish at 6:30 p.m.
champion; PRISAA National Champion –Western Visayas University Selection, the PRISAA national champion; Pampanga provincial champion’s Angeles University Foundation (AUF); and Philippine-Korea Friendship Games Champion's San Sebastian College-Cavite. Two other foreign teams declined an invitation to participate in the tournament due to swine flu epidemic. Wilson is the official basketball of the games. AUBC crown. Cebu’s Southwestern University placed third and Korea’s Hanyang University settled for fourth place. (LWUA) will jointly do the ceremonial toss to open the tournament organized by the BAP in cooperation with the Manila Sports Council (MASCO) under chair Niňo Dela Cruz. Technical Director is George Magsino and Tournament Commissioner is Gil “Boy” Reglo. Asian University Basketball Federation (AUBF) Secretary General Graham C. Lim of the Basketball Association of the Philippines (BAP) who represented BAP president, Senator Antonio Trillanes and AUBF president Shin Dong Pa of Korea, respectively, together with the Malaysia’s Education Minister Dato’ Saifuddin Bin Abdullah pose for a souvenir photo with China’s Guangdong University following its 95-66 victory over the National Taiwan University of Arts in the finals of the 8th Asian University Basketball Championship held at the Bintulu Municipal Stadium, Sarawak, Malaysia. Also in photo are Bintulu Basketball Association (BBA) chairman Wong Hong Gouk, BBA president Lawrence Hii, Malaysian Basketball Association (MABA) vice president Ling Kuok Kai, and AUBF’s Malaysia representative Tan Kee Hian. Taiwan University of Arts in the finals of the 8th Asian University Basketball Championship held at the Binutlu Municipal Stadium in Sarawak, Malaysia. 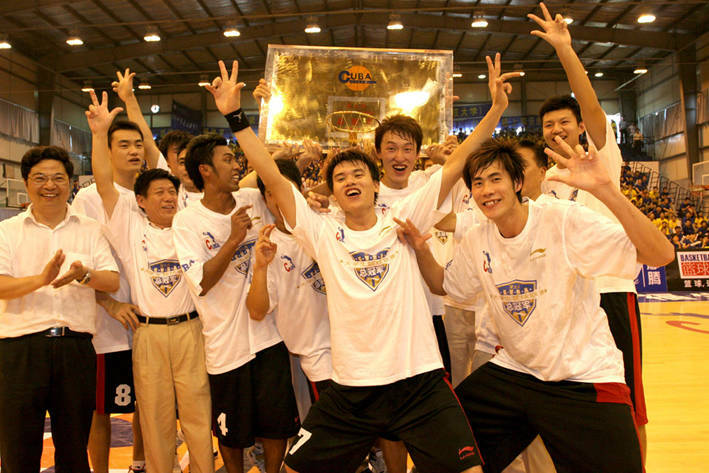 With 6-foot-8 twins Ren Jun Fei and Ren Jun Wei, 6-9 Li Yuan Yu and 6-11 Da Lai Wu combining for 53 points, the Chinese totally dominated the Taiwanese from start to finish to capture the AUBC title once held by Hua Qiao University of China in 2007. Universiade in Shenzhen, China in August where the Philippines is one of 24 participants in men’s basketball. Taiwan was overwhelmed by China’s tremendous height advantage and was unable to keep pace with its opponents. The Taiwanese were bannered by Lai Kuo Wei, who scored 21 points, and Hsiao Shun Yi, who added 19. Meanwhile, the University of the East (UE) of the Philippines routed Malaysia, 85-67, to grab third place in the prestigious tournament held annually. Paul Zamar topscored for the Philippines with 20 points, including a pair of three-point shots that allowed his team to pull away from the Malaysians, who had beaten the Filipinos in first-round action. Three other players scored in double digits for the Jerry Codiñera-coached UE Red Warriors – Adrian Santos, 18,Benjamin Zosa, 11, and John Michael Noble, 10. UE’s trip was made possible by the Basketball Association of the Philippines (BAP) and the Federation of School Sports Association (FESSAP), the latter of which is the local university sports body recognized by the Federation of International University Sports (FISU), the organizer of the Summer Universiade and World University Championship. Attending the 8th AUBC closing ceremonies were AUBF and BAP secretary general Graham Chua Lim, who represented BAP President Senator Antonio Trillanes IV and AUBF president Shin Dong Pa of Korea, Malaysian Education Deputy Minister Dato' Saifuddin Bin Abdullah, Bintulu Basketball Association (BBA) chairman Wong Hong Gouk and president Lawrence Hii, organizer Tan Kee Hian and Malaysia Basketball Association (MABA) vice president Ling Kuok Kai. The tournament was further boosted by the support of FIBA-Asia officials. With the event's successful staging in Sarawak, Minister Bin Abdullah has already informed the Asian University Basketball Federation (AUBF) through secretary general Graham Chua Lim of Kuala Lumpur's intention to host the 9th AUBC competitions early next year. China (95) - Yu Guang Long 19, Ren Jun Fei 17, Li Yuan Yu 16, Chen Da Peng 13, Da Lai Wu 12, Ren Jun Wei 11, Qing Cong 5, Zhang Zhan 2, Lu Zhen Yu 0. 3, Hung Wei Chun 2, Chung Chih Pang 2, Yu Wei Chen 0, Tsai Ho Lin 0. 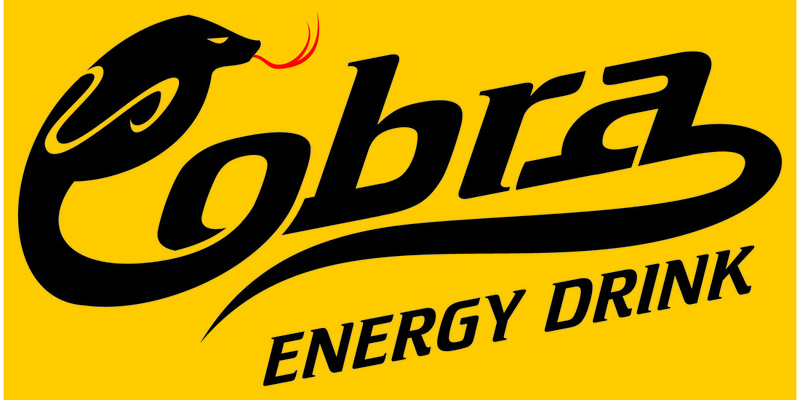 Paul Zamar 20, John Michael Noble 15, Adrian Santos 12, Christopher Javier 8, Benjamin Zasa 7, Jhon Sumido 7, Ronnie de Leon 4, Lucas Tagarda 4, Shej Roi Sumang 4, Erwin Duran 2, Jairold Flores 2, Mark Esclamado 0. Sing Tee 12, Wong Wee Seng 2, Amirui Effrendy 2, Hadzri Bin Harman 2, Tan Cheng Kiat 1, Sassinferan Selvaraja 0, Riza Bin Ahmad 0. 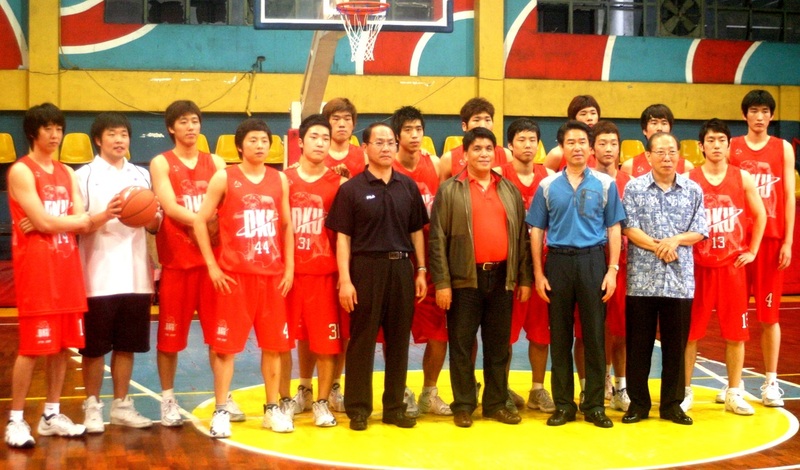 8th AUBC runner-up to National Taiwan University of Arts’ head delegation Lee Po Lun, with coaching staffs‘ Lu Ching Shan, and Liu Rong Tsong, receives runner-up trophy from Asian University Basketball Federation (AUBF) and Basketball Association of the Philippines (BAP) Secretary General Graham Chua Lim (front row, 4th from right) during the closing ceremony at Bintulu Stadium, Sarawak, Malaysia. Basketball Federation (AUBF) in cooperation with the Federation of School Sports Association of the Philippines (FESSAP) and Basketball Association of the Philippines (BAP). Teknologi MARI of Malaysia (0-5), De La Salle University of Dasmarinas (2-3), down host Trinity University of Asia (1-4) to rank fourth. FESSAP President David Ong, FESSAP vice president Tisha Abundo, BAP Executive Vice President Christian Tan, FESSAP Deputy Secretary General retired Colonel Ariel Querubin, Peewee Lim of Cobra Energy Drink and host Trinity University of Asia athletic director Milagros Gutierrez witnessed the finals of the annual event won by Guangdong University of China last year in Bintulu, Malaysia. Jess Tanchanco, team manager of the University of the East (UE) and UE Head Coach David “Boycie” Zamar received the trophy from Cobra Energy Drink representative Peewee Lim of Asia Brewery and FESSAP officials. 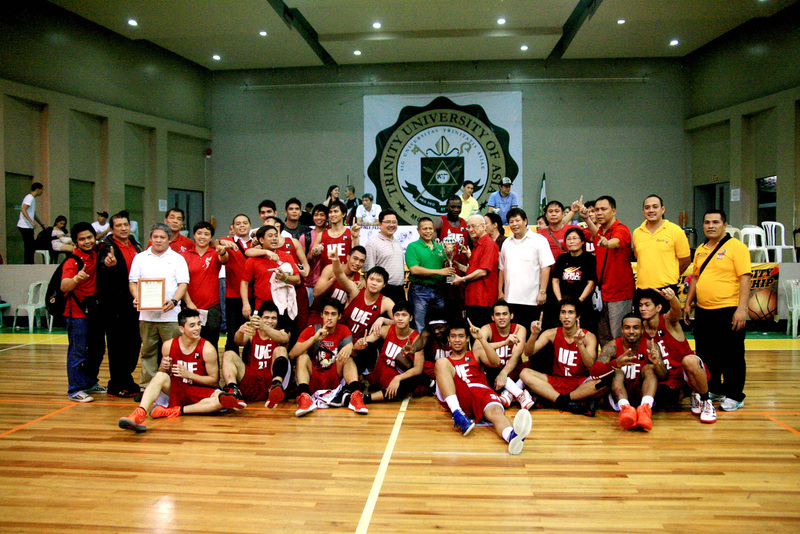 UE Red Warrior JM Noble was named tournament’s Most Valuable Player. ​10th ASIAN UNIVERSITY BASKETBALL CHAMPIONSHIP IN SANTA ROSA CITY, LAGUNA PROVINCE, SOUTH OF MANILA CITY ON NOVEMBER 18 TO 23, 2018. Hosted by the City of Santa Rosa Mayor, Honorable Danilo Ramon S. Fernandez. Organizing Committee Chairman is Mr. Leonardo Andres Sr.